While I’m in the process of updating my out-of-date, hand-coded website, it seems logical to start by putting First Things First on my blog and Twitter feed. So, I’ve just signed the First Things First 2014 manifesto. An interpretation of Ken Garland’s original, published 50 years ago, and signed by 21 designers and artists. 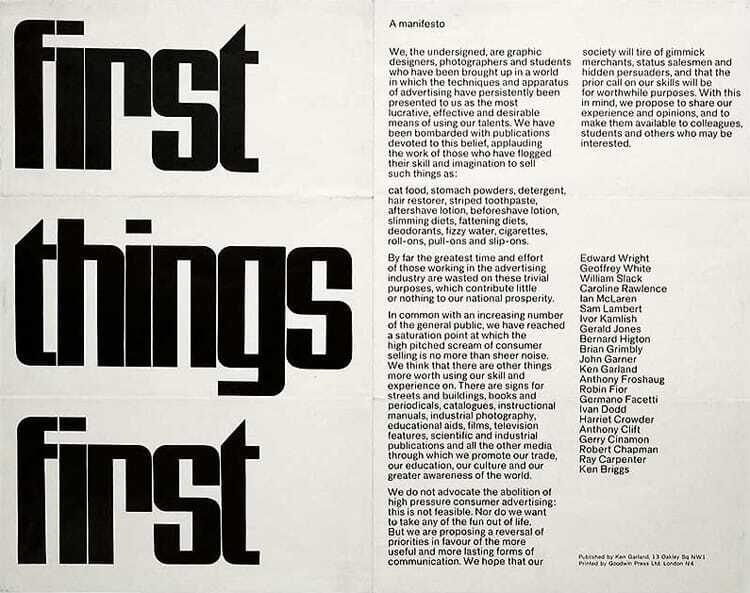 Whilst a design student in the mid-90s, I was only able to signed the original manifesto in the privacy of my own head. As a recent graduate, the manifesto was revived and updated for the millennium. Again, I was only able to sign the newer version in my own mind. Now, 14 years on, with the help of Cole Peters I have finally put my name to it.